Celebrating the Life and Work of Dr. Martin Luther King, Jr. Many chapters in the story of civil rights leader Martin Luther King are well known to Americans. The I Have a Dream speech. The Nobel Peace Prize. The Mountaintop speech. His Letter from the Birmingham Jail. His commitment to nonviolence. All the incredible accomplishments of a visionary. Our series on Martin Luther King, Jr., to mark the 50th anniversary of his assassination in Memphis, Tennessee, on April 4, 1968, covers some of the lesser known parts of his history. Follow the links below to discover more about this civil rights icon. 1. Jay Smith, UNAC/UHCP’s counsel, who shared a story his mentor, Jerome A. “Buddy” Cooper, told about King’s Birmingham campaign. 2. 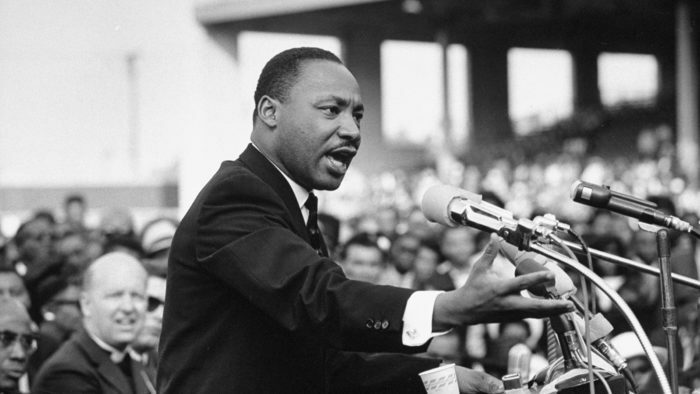 King is perhaps best known for his iconic 1963 I Have a Dream speech. Less is known about predecessors to that speech, like the one King gave to the AFL-CIO in 1961. 3. The Reverend Martin Luther King, Jr., began with prepared remarks, the most famous part of the speech containing the theme I have a Dream was created on August 23, 1963 as King addressed the crowd of over 250,000 on the Mall in Washington, DC. 4. King accepts the Nobel Peace Prize and then joins workers on strike in Atlanta, Ga., to publicize their campaign during ten days in December 1964. 5. ILWU Local 10 made Martin Luther King an honorary longshoreman in 1967. When Dr. King was assassinated, the longshoremen showed they truly regarded him as one of their own. 6. Jerry Wurf, AFSCME’s president in 1968, was a strong and consistent supporter of King, as well as the civil rights movement in general. 7. Death and a workers’ strike bring Martin Luther King to Memphis. 8. Martin Luther King stand with the Memphis sanitation workers as they ask for respect for their humanity. 9. Dr. King’s second-most famous speech, given the night before he was assassinated, was an eloquent exploration of injustice, the greater good, and his faith in progress. 10. A final tribute to Dr. Martin Luther King.